Wisconsin Oven, a leading manufacturer of industrial ovens, announced the introduction of the Express Batch Oven (EBO). The Express Batch Oven is a standardized batch oven that allows Wisconsin Oven to deliver at a lower price point and shorter lead time without compromising quality. East Troy, Wisconsin: Wisconsin Oven, a leading manufacturer of industrial ovens, announced the introduction of the Express Batch Oven (EBO). The Express Batch Oven is a standardized batch oven that allows Wisconsin Oven to deliver at a lower price point and shorter lead time without compromising quality. 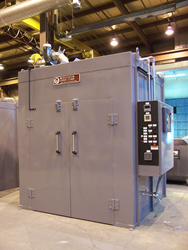 Available in 26 sizes, and in either electric or gas models, the Express Batch Oven is ideal for businesses who specialize in powder coating or finishing applications. In addition to finishing applications the Express Batch oven can be used for a variety of applications such as drying, epoxy curing, bonding, metal finishing, varnish curing, baking, adhesive curing and more. The Express Batch Oven is designed with heavy duty construction and high-quality components. The recirculation system features a combination air flow pattern that can be fully adjusted via the return and supply ducts to maximize heating rates and temperature uniformity. Other standard features include a maximum temperature rating of 500° F and roof-mounted blowers to save valuable floor space. The Express Batch Ovens are also backed by Wisconsin Oven’s Exclusive and Unprecedented 5-Year WOW™ warranty. This warranty covers all materials for all components (less wear items). The Express Batch Oven is available with several additional options. Customers can protect their factory floor by adding floor sheets of 12 gauge aluminum or reduce the energy consumption by adding an insulated floor. Other popular options include a door limit that shuts down the heat when it senses that the doors are open to minimize the spill-out of hot air, and upgrading to a controller that can be programmed with up to 25 recipes and up to 500 ramp and soak segments. The Express Batch Oven is fully factory tested and adjusted prior to shipment to help reduce installation and start-up times. A 150 point Quality Assurance check list is completed to ensure the equipment meets all Wisconsin Oven quality standards and helps installation and start-up to go smoothly.